Located within the picturesque town of Elora, alongside the Grand River, Elora Mill Condominiums is a new addition to the sprawling landscape and incredible Elora Mill Hotel & Spa. 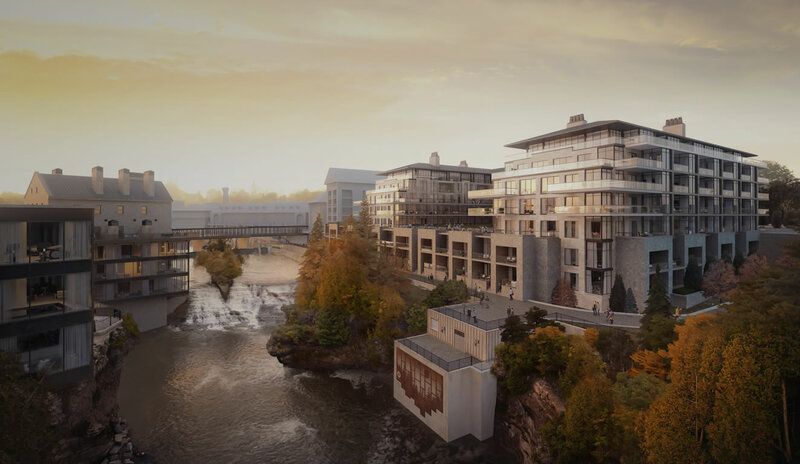 Each detail—from the craftmanship techniques to the pedestrian bridge connecting to the hotel’s many amenities and the materials used—has been carefully chosen to honour the Elora’s existing riverside presence. Experience luxury as a standard in your new residence along the Grand River. place to unwind solo, all the lavish amenities you need are here at Elora Mill, including our stylish Penstock Lounge for dining, a stunning rooftop pool situated above the river and the renowned cliffside spa. Enjoy a classic setting filled with sophisticated small-town charm, tranquility and freedom wherever you roam.